The Storm Keeper’s Island is a fantasy adventure novel set on the island of Arranmore, off the coast of Ireland. Fionn and his sister Tara are sent to stay on the island with their illusive grandfather for the summer. From the first chapter it was clear that this is a very special island…it is alive. The island is under the care and protection of the current Storm Keeper – Fionn’s grandfather. 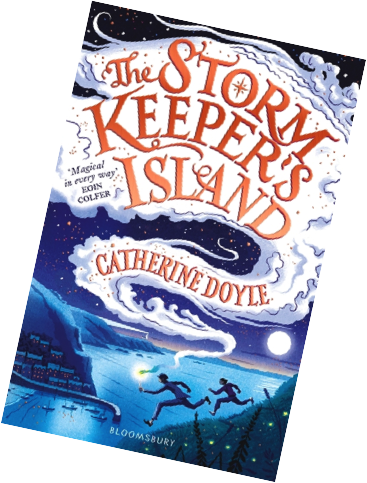 By burning special candles made by previous Storm Keepers, Fionn and his grandfather are able to revisit different points (layers) in the island’s history, often being confronted by events that have shaped their own lives. Although there is magic on every page of this book, the story also touches on the very real subjects of loss, family bonds and bravery. The relationship between Fionn and Tara is one that anyone with a sibling will be able to identify with! As Fionn’s grandfather grows older and weaker, a new Storm Keeper is rising…but so is a darker, more sinister magic. Magic that has been buried deep underground, biding its time and waiting for the new Storm Keeper. I loved this book. It is full of magic, but with a deeper and darker twist which gives it a unique appeal. From the dramatic way the book ended, it is clear a sequel is planned – or at least I hope so!